Back of card: Ornate, green on white. There is a border of cherubs, grapes & heraldic crests. Inside that, the top of the central panel has an image similar to the Hermit - an old man with beard & cloak. Reflected below that, an image similar to Death - a skeleton holding an hourglass. Not symmetric, but, overall, you could invert these if you're not fussy. Booklet included: Yes, 64 pages, stapled. Measurements: 2.58 x 4.72 inches, or 65 x 120 mm. Contains instructions in English, Italian, Spanish, French & German. Includes diagrams for four spreads. Comments: Albrecht Durer, 1471 - 1528, was the greatest of all German Renaissance artists. He was an engraver as much as a painter & through his greatness transformed what is (still today) a rather humble artistic profession. While Durer's art remains glorious, this deck has other things on its mind. 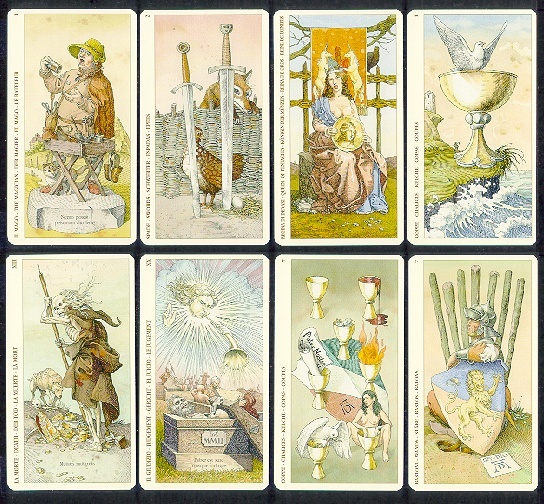 Each of the major arcana cards is inscribed in Latin. Translations are given in the booklet. For the cards shown above, The Magician: No one can wear a mask. For Death, Changing that which must be changed. For Judgment: Everyone is the author of their own destiny. Specific animals are associated with many of the major arcana cards: Fool - Crow. Magician - Cat. High Priestess - Serpent. Empress - Monkey. Emperor - Vulture. Hierophant - Dog (also for Death). Lovers - Doves, etc. Animal allegories continue in the minor arcana. Chalices have doves; Pentacles have eagles; Wands have lions; Swords have foxes. Most interesting of all, Gaudenzi adds Heraldry to the deck. Heraldry is a (secretive) symbolic language entire unto itself. It is odd to see it in a tarot deck, not because it is wrong or uncommon, but because of the vast expansion it brings to the cards. Given that there are heraldic meanings for all the animals shown in the deck, and that crests often have Latin mottoes attached, Gaudenzi may possibly have added meanings to cards beyond what is commonly seen in tarot, beyond the booklet that comes with the cards, beyond what can be found in any tarot book. Or he may have not done so - there are few such references in his other decks. Or it might have been Manfredi Toraldo. In the notes with the Olympus Tarot, he is described as "eclectic", an engagingly vague term. As I confess that my knowledge of Heraldry is weak, I would appreciate feedback. Is the Tarot of Durer primarily heraldic in execution & design?